Becky Stern is a DIY guru and electronics and textile artist who incorporates technology into everyday objects. She's Director of Wearable Electronics at Adafruit in New York where she creates how-to's for projects ranging from LED sneakers to 3D printed unicorn horns to dance-activated LED skirts. Becky is learning to ride her 1975 Honda CB200 motorcycle, has dressed up like a poop emoji for Halloween, and has a BFA in Design and Technology from Parsons School of Design. To learn more about her projects, watch her videos and live show on Adafruit's YouTube channel, follow her on Instagram, her personal YouTube channel and her website. 1. What's the best tech advice you've ever received? I have learned this same advice from several mentors throughout my life: Creative tools will always change, so it's not really about what gear you have but rather your ability to execute your vision with what's available to you. When buying a camera for day-to-day project documentation, for instance, it's far more practical to choose one that's small enough to actually carry with you everywhere instead than the top-of-the-line DSLR. Your creative abilities extend far beyond the limits of your technology. 2. What is your worst tech habit? Browser tab management. At any given time I've got up to 80 tabs open across two different browsers. They're a dysfunctional to-do list, things I mean to finish reading later, pages I want to refresh to see new comments, and plenty of pages I should just close already. 3. Are you sporting a wearable right now? If so, what is it? Two, actually. I've been digging my Ringly since taking one apart at Adafruit. Since my phone hasn't fit in my pants pocket for quite a few phones now, it's refreshing to catch notifications on your jewelry, and reduces the compulsion to check my phone all the time. The other is the Lumo Lift, which is making a dent in my slouch-induced back pain, one day at a time. The funny thing about it, though, is that I've been conditioned to think of haptic feedback as a message notification, so when it vibrates to let me know I'm slouching, I often first think I have a text message. We're in such an awkward stage of augmenting our bodies with technology, but it's also such a fertile time for new ideas and devices-- I'm enjoying the experiment. 4. If you could have any superpower what would it be? 5. What is your #1 tech pet peeve? Preorder hype for hardware that doesn't exist yet: It's becoming increasingly common to see tech reviews and buzz about devices that are still a year or more out from production. By the time the device becomes real (if it does at all), it's hard to live up to its expectations. I get a lot of folks asking me to write about their Kickstarters or pre-order products, which clogs my inbox and makes it hard to separate who's actually making (and shipping) the most innovative products from who's just blowing a lot of ideas around. 6. What is your go-to karaoke song? I really don't enjoy karaoke, but have been talked into it before and did not hate singing "Criminal" by Fiona Apple. 7. Who would play you in your biopic? My ego says it would be Mackenzie Davis. Her role in AMC's show Halt and Catch Fire shows she can portray a highly technically-capable and strong woman who powers through tough challenges. In The Martian, her character excels under intimidating circumstances. But she's certainly way too tall and not nearly awkward enough to play me-- a much more characteristic fit would be Amy Sedaris. I love her quirky style and we're both always breaking into song. 8. Who is your favorite villain? 9. If you could create an emoji not yet in existence, what would it be? What's a whale's favorite activity? To catch fish and krill. 11. How do you disconnect? I like to take my dog to Prospect Park in Brooklyn in the early morning and walk on the trails with some other dog-owning friends. It's a great way to spend meaningful time outside and jump start a weekend day. 12. What is your favorite GIF? I have a few. Here's one from the Free Art and Technology project "Occupy Internet"
13. What was the last thing you Googled? Water bear horizontal gene transfer -- those things are nuts! 14. If you were a cocktail, what kind of cocktail would you be? 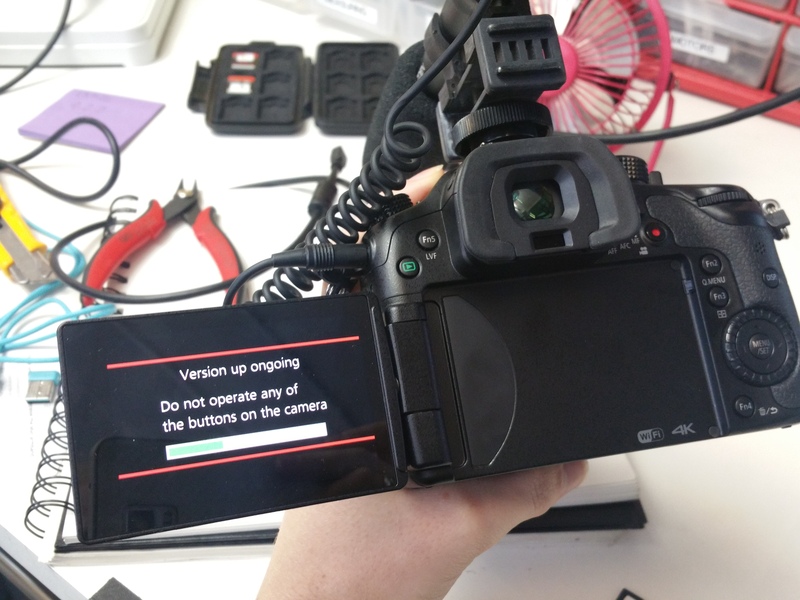 I was updating the firmware on my GH4 and thought the wording "Version up ongoing" was funny. 16. What device(s) are you currently lusting after? My answer to #1 helps me not succumb to the latest lust-worthy gadget, or at least have the healthy skepticism to know that no device will 100% solve a problem or guarantee to make me a happier human. That said, I wish the Spire would come to Android soon. 17. What aspect of your life remains analog? 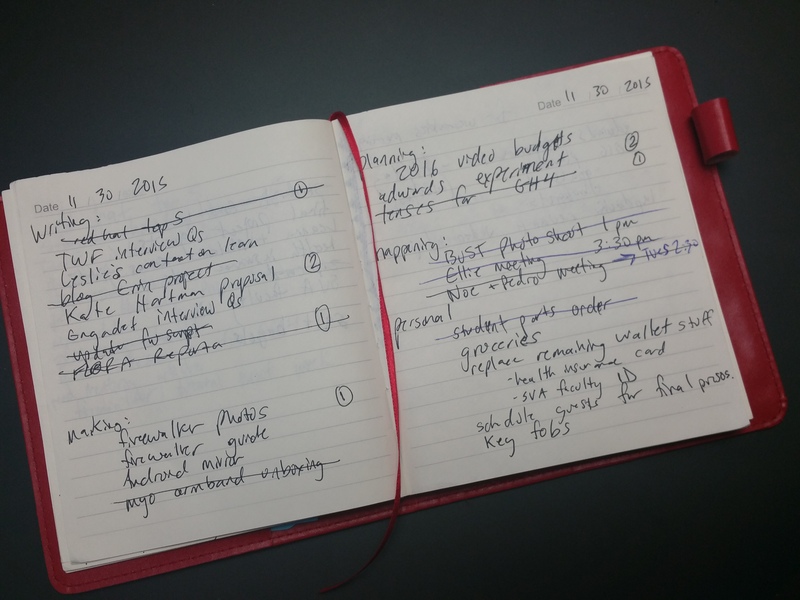 My to-do lists are usually on paper-- writing things down helps me remember them better, and it's very satisfying to cross off tasks when they're complete. I generally make a new to-do list every morning. Print All Over Me - It's really fun to play around with different images and scale on garments. Here's a sweatshirt my boyfriend recently made. If you like taking things apart, beware of lithium batteries. If you puncture or slice them, they might swell and possibly explode. So I always keep a sandbag, trash bin, or other way to quickly contain the battery as it overheats. 20. What reality show would you like to see created? Prepare for esoteric disasters like plague, zombies, and the like. 22. What is the last book you read?